Blog: What’s all this fuss about Ancoats? 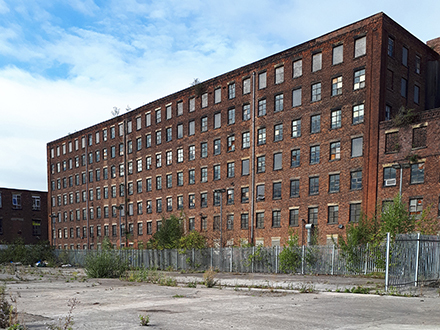 Our latest project Pollard Yard will see us open hundreds of affordable workspaces near Manchester city centre. Here’s our round up of our favourite places to eat, drink and generally hang out in the surrounding area, Ancoats. Known as ‘Cottonpolis’, in the 1800s Ancoats was the epicentre of the industrial revolution and Manchester’s thriving cotton industry. Falling into economic decline in the 1930s, the area has been revived and regenerated in recent years with new coffee shops, venues and coworking spaces popping up all the time. Pollard Yard is to the east of the main Ancoats area, in easy walking distance from all of the following amazing places! 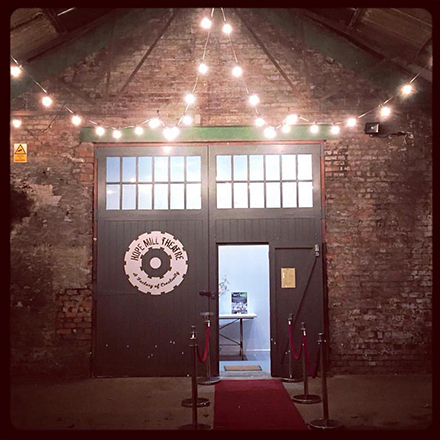 Since opening in 2015, Hope Mill Theatre has become one of the most successful and reputable independent theatres in the country. The Theatre runs a busy programme of grassroots’ and touring productions plus more unusual offerings like forthcoming part-immersive, part-musical clubbing experience Club Mex. It’s also got a lovely bar and restaurant and is home to AWOL studios. Opening times vary, 113 Pollard Street. 3 min walk from Pollard Yard. This new eco-park was created to provide a city centre refuge for wildlife, particularly birds. 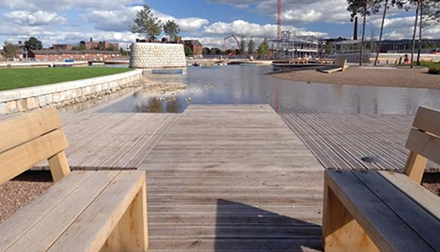 A boardwalk and seating edges onto a marina and a series of floating islands, with wildflowers, bird boxes, reeds and Scots pines all helping to attract wildlife. With lovely views and a growing barge community, Cotton Field Park is a great spot for people watching and is a lovely little oasis for enjoying your packed lunch! Open 24 hours, Cotton Street. 10 min walk from Pollard Yard. Quite possibly the producers of the finest sourdough and viennoiserie in the land, Pollen Bakery is THE place to go if you’re in need of a puff pastry fix. We can’t get enough of their croissants, and every time we pop in we leave with armfuls of delicious baked goods. Open Wed-Sun, Cotton Field Wharf. 11 min walk from Pollard Yard. 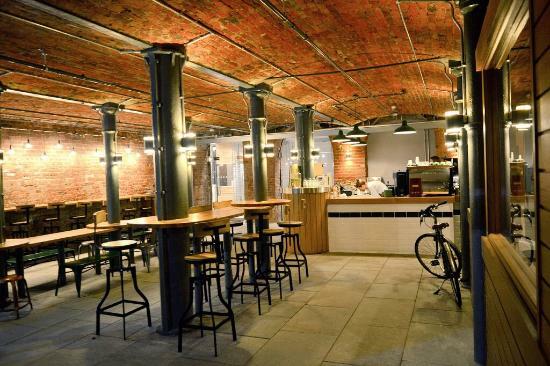 Ancoats Coffee Co is a mecca for coffee lovers, who can sample the café’s the ever-changing menu of single origin coffees, all roasted onsite. Also on offer are pastries, brekkie, lunch and a revolving programme of special events such as supper clubs, barista challenges and home brewing workshops. Royal Mills, 17 Redhill Street. 14 min walk from Pollard Yard. Open 7 days a week, 9 Cotton Street. 16 min walk from Pollard Yard. 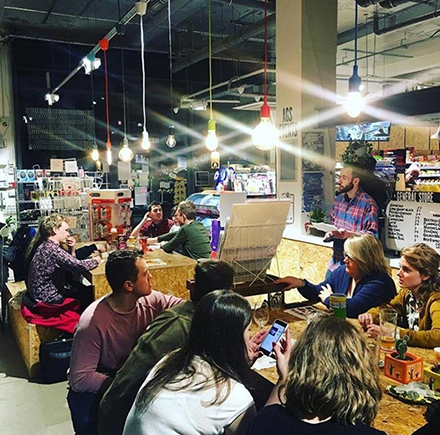 Not your usual neighbourhood convenience shop, Ancoats General Store prides itself on stocking local produce, unusual craft beer and freshly baked bread. This popular hipster hang out has its own cafe, welcomes street vendors every Thursday and regularly hosts parties, quiz nights and interactive art events. Open 7 days a week, 57 Great Ancoats Street. 17 min walk from Pollard Yard. Nestled just between Ancoats and the Northern Quarter, the Frog & Bucket prides itself on supporting northern acts and supporting grass roots talent. The award-winning comedy club runs regular open mic and amateur nights. Now legendary early career stand-up gigs of the past include those by John Bishop, Johnny Vegas and Peter Kay. Open Mon, Thurs, Fri and Sat evenings, 102 Oldham Street. 20 min walk from Pollard Yard. Once you’ve made it down to the Frog & Bucket, you’re also just a stone’s throw from Manchester Craft & Design Centre, revered live music venue Band on the Wall and the boutiques and cafes of the Northern Quarter. Plus of course there’s the Eithad Stadium. Man City’s base is a 14 min walk east of Pollard Yard, in the opposite direction to the Northern Quarter. We’d love to know which pubs, cafes and venues you choose to hang out in and around Ancoats – just comment below.